Chooda matar or chiwda matar is basically a Banaras version of pohe. 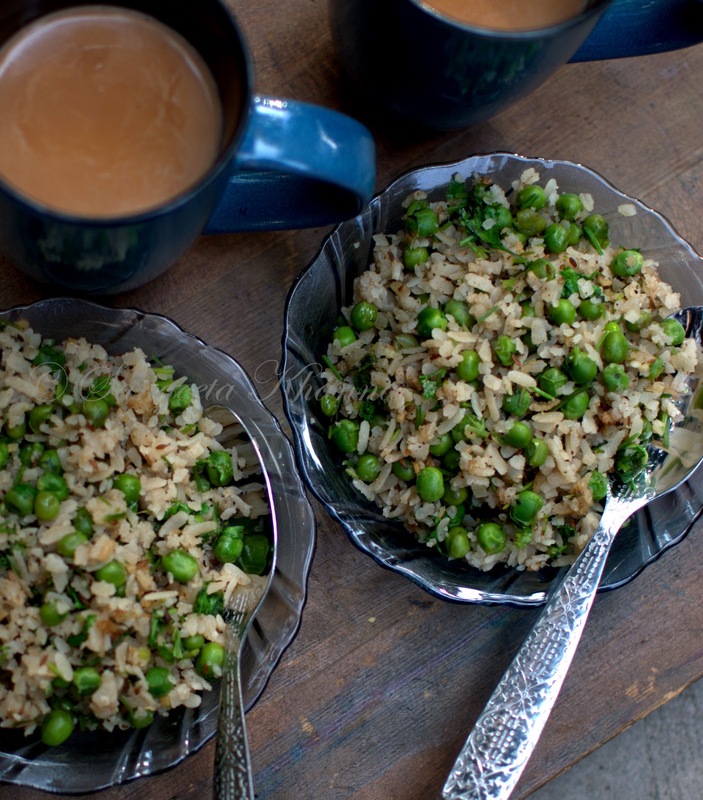 A winter treat with fresh green peas and the new crop of paddy made into flattened rice that is called Chiwda or chooda in the region is concocted into a spicy warm breakfast that I believe is the best cereal breakfast ever. Warm, savory and refreshing flavors of winters. Chooda matar is very much a homely dish, taken up well by some street food joints (chaat bhandars)in the city as well. I remember Kashi chaat bhandar for it's chooda matar that is literally soaked in ghee, but very warming flavors of garam masala coming through. I liked this combination of sweet green peas, hot garam masala and aromatic ghee in this dish. This garam masala, milk and ghee laden chooda matar is miles away from the aalu poha or kanda poha of Maharashtra, it is available in the winters in all the chaat bhandars of the city and is loaded with desi ghee. I make it lighter at home and according to my taste buds, as a favorite winter breakfast on weekends or an evening tea accompaniment on weekdays, but we have to skip dinner after that. It is a full meal when you have a large portion. Just like a tehri or pulav. 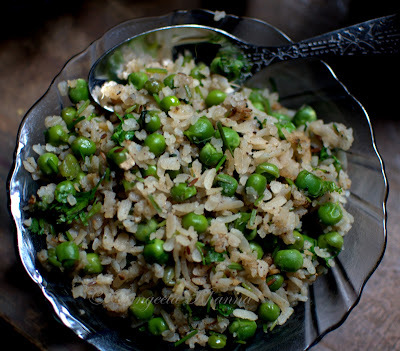 Good quality pohe or chiwra is essential for making chooda matar, Basmati or Govidbhog chiwra makes the best. I remember when we were in Dhanbad, the fragrant Govindbhog chiwra was available there, a short grained rice made flatten rice in the season, that was the ultimate for chiwda matar. Here in Delhi I make it with Basmati chiwda and it turns out good. Rinse the chiwra through a strainer, drain well and soak in milk and cream for 10 minutes [less if it is finer]. Heat ghee in a pan and add cumin/jeera into it, add in the ginger and green chilies when the jeera crackles,after a few seconds add in the powder masalas. 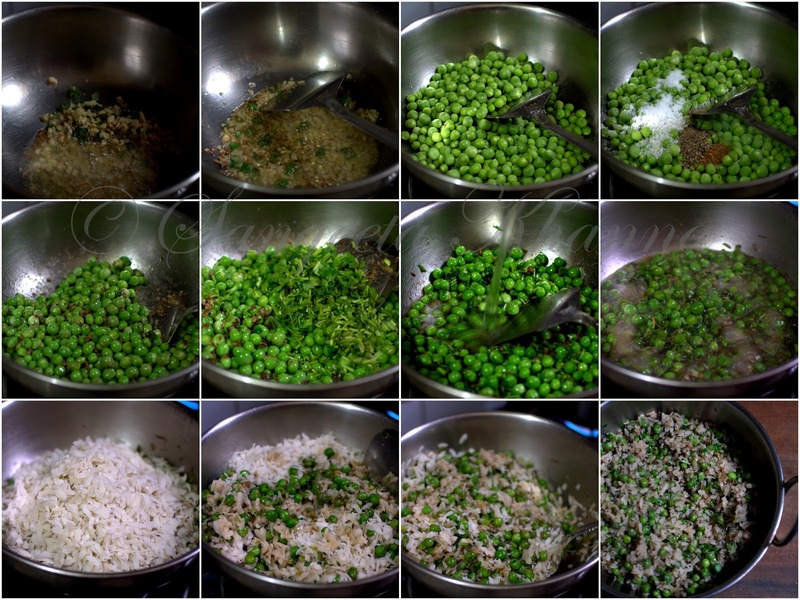 Stir and immediately add in the peas with sugar and salt, stir, add the coriander stems and add 1/2 cup of water and cook covered on medium heat until the peas are done. Open the pan, there should be still some water left, add in the soaked chiwda and mix well, fluffing it up. I sometimes add the finely chopped stems of coriander leaves at this stage n after mixing cook it covered on low flame for 3-4 minutes. This collage shows all the steps in the making of chooda matar. Add the coriander leaves and lime juice..mix well and serve garnished with fried dry fruits, which I seldom do. 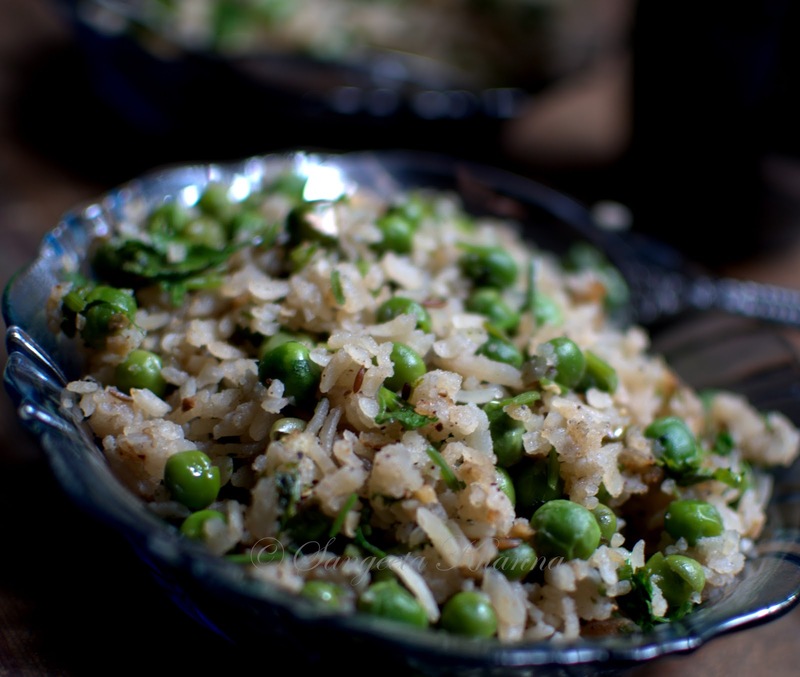 You would see loads of raisins and fried cashews in the chaat bhandar versions, at home we like the green peas shining more in our chooda matar. It is loaded with a strong aroma of green coriander and garam masala, There is heat owing to a lot of ginger, black pepper powder and green chilies too, balanced by lime juice if you use. I avoid lime juice mostly as I like the stems of coriander greens to impart their earthy citrusy flavor more. Truly a winter food. 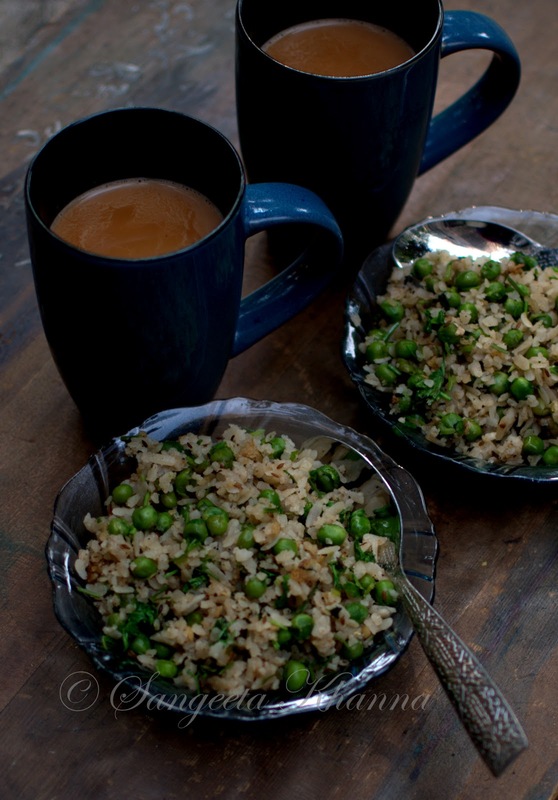 Have it with a hot mug of masala chai and your day is bliss. Chooda matar , kya baat hai :) sardiyon ki yaad dila dee aapne... kya aapko banarasi tamatar chaat ki recipe maloom hai... woh sirf banaras mein hee milta hai... please share kijiyega agar maloom ho toh..
if you like tamatar ki chaat from kashi chaat bhandaar, i can post that one too , but that is not my favorite so i make the other version more......there are many versions available in banaras.......oh i can go on talking about banaras food....keep in touch , i am delighted to have banarasi people on this space. I am from Varanasi but living in Montreal Canada. I like tamatar ki chaat from kashi chaat bhandaar and I also like tamatar ki chaat from Deena Chat Bhandar. How do you make it? Is it possible for you to post it? Thanks a lot. Hello Pratima ... I have posted a tamatar ki chaat on this blog , see here.. I have to make a labels list here so that you all can find the recipes ... thanks for reminding me that. NIce to find Banarsis here...my hometown is in banaras...thanx a lot for posting recipe of chooda matar..we as a banarsi can only know about the flavour of chooda matar..i tried to make my husband have it..He liked it but then he tried to compare with traditional poha....I LOVE CHOODA MATAR..Thnax again.. Thanks for your post,I would like to have Kashi Chaat Bhandar's whole stuffed tamatar chat which they make on tava. If you can provide that would be nice. I will try and make that version of stuffed tamatar , though i do not remember the taste much ...i am not much of a chaat lover and have not sampled all of the chaat varieties of banaras , i will be visiting banaras in Feb-March and then will try and taste that . So your stuffed tamatar can take a liitle time before it comes on this space . Thanks for connecting here , i love Banaras people coming here n having a word with me. Have you tasted Whole tamater chaat on your last visit to Banaras? Any way.... I was looking for the recipe aate ka golpappe,if you know could you please provide me recipe of Aate ke golgappe? Thats no problem Sangeeta, I tried by myself and it turnout good. Nice talking with you. That's great Pratima. Would you like to share the recipe here? Would be great if you can, I'll publish it with credits. Nice to see all these chat recipes from Banaras. I am an avid and passionate cook and have already decided the theme for my next party ' Banaras Chat Night'. Anyone wants to join? where do you get good banarsi chiwda in Delhi? I use shaktibhog chiwda Alpana. Shaktibhog or Rajdhani both work well. where do yuo get good quality basmati chiwda in delhi? I use Rajdhani chiwda for making chuda matar. Recently I was in Varanasi. Had Chat as well as Chura Matar at Kashi Chat Bhandar. And also on the occasion of Makar Sankranti had home made Chura Matar. Delicious it was. Glad you liked it Tushar. I'm not going to make poha again..ha ha . Loved the flavours in this recipe. Thanks for a great recipe. Oh nice :-) Thanks Mini.